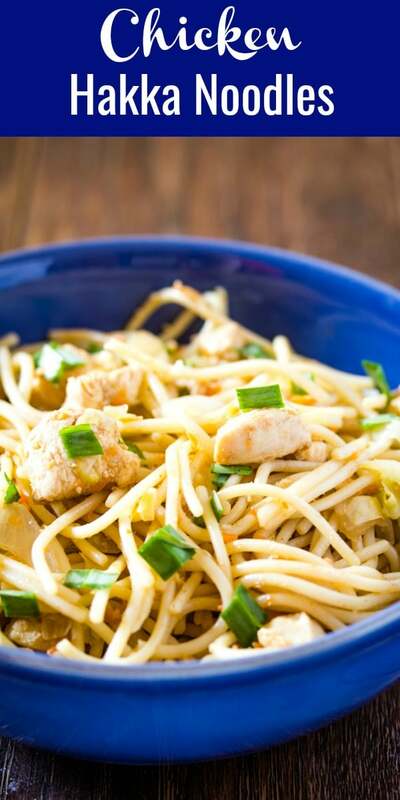 Chicken Hakka Noodles are a delicious and easy Indo-Chinese noodle recipe which are just as good as the street food version…only these noodles are more hygienic! We love our Indo-Chinese recipes here at I Knead to Eat, and have a yummy growing collection of these street food recipes! 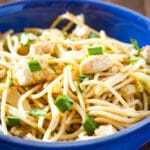 To make a complete meal along with these Hakka Noodles, you can make this Easy Chicken Machurian and Hot and Sour Soup. 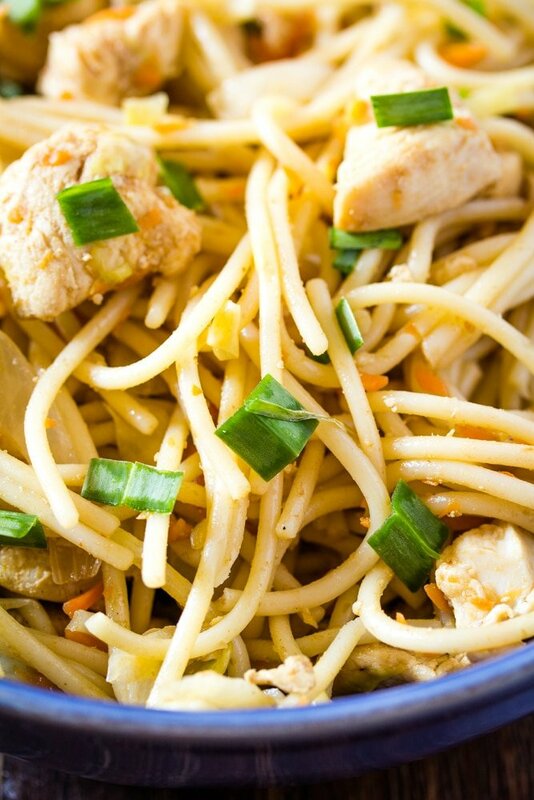 These Chicken Hakka Noodles are a childhood favorite, and to date its one of my most beloved comfort foods. When I was younger, my mom would make these chicken Hakka noodles quite a lot, and I would very happily eat them each time. 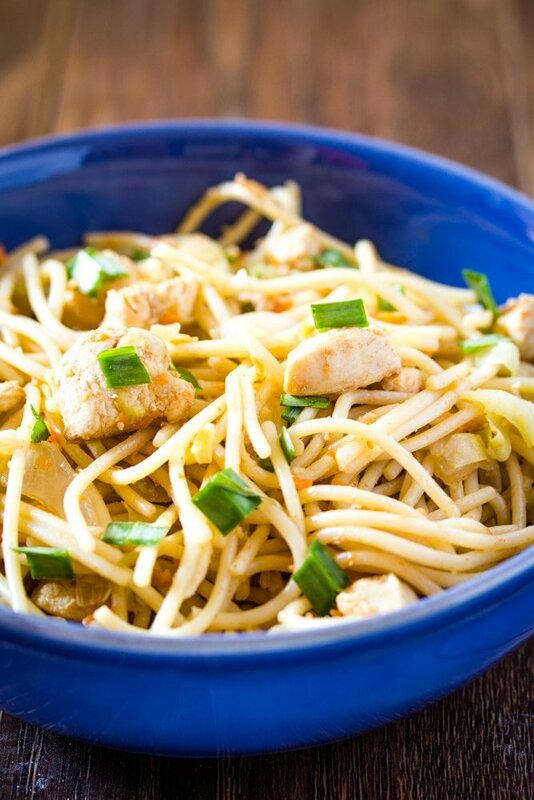 Hakka Noodles are a quick and easy delicious recipe. Like all Indo-Chinese recipes though, they involve chopping vegetables and also require fast cooking on high heat. So I always have all the ingredients prepped and chopped before beginning to cook these Hakka noodles. What Kind of Noodles Should You Use for Hakka noodles? I used regular spaghetti in this recipe as you can see in the pictures. But egg noodles would be a great option too. Start by boiling the noodles according to the package instructions. Once cooked, drain and toss with 1-2 tablespoons of oil, and set aside while you prep everything else. In a wok, add the garlic and ginger paste in oil, and cook for 10-15 seconds while stirring. Add the chicken and cook on high heat until the chicken changes colour and is cooked through. This will take about 5-7 minutes. Add the sliced onion and cook for another 1-2 minutes. Don’t let the onion brown. Then add the other vegetables (I used cabbage, carrot, and green bell pepper) and stir fry on high heat for a few more minutes until the vegetables are just softened enough. Add the noodles, soy sauce, chilli garlic sauce and toss until everything is completely coated with the sauce. Top with sliced green onion, and serve immediately. It’s so easy to customize Hakka Noodles to your taste. 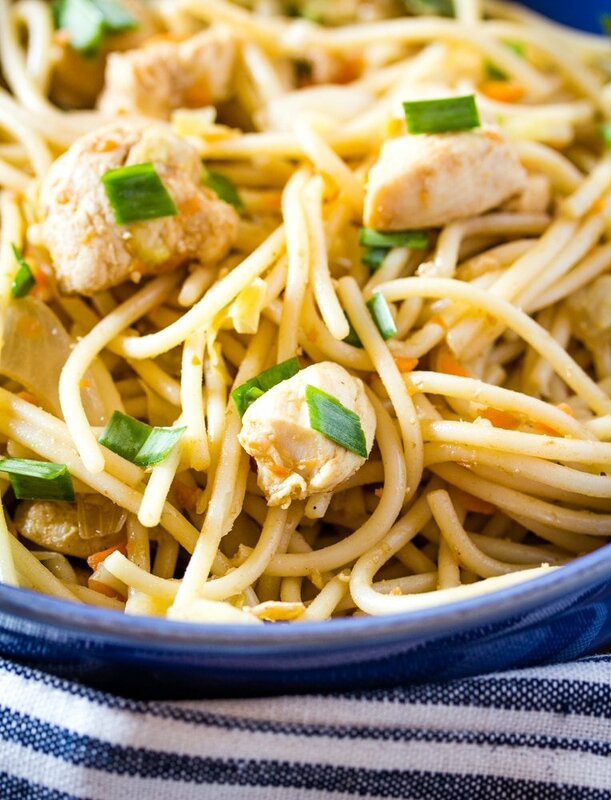 For vegetarian or Veg Hakka Noodles, just omit the chicken and add more veggies such as slices mushrooms and bean sprouts. Even green beans would be delicious in these Hakka noodles. For a seafood version, you can just add some shrimp instead of the chicken and it should be a delicious seafood Hakka noodles version. Heat oil in a wok, and add the ginger garlic paste. Fry for about 15 seconds or so, and then add the chicken. Saute the chicken for 2 to 3 minutes, then season with salt & pepper. Cook the chicken for another 5-7 minutes until it changes colour and is almost cooked through. Add the sliced onion and cook on high heat for 1-2 minutes. Then add the cabbage, bell pepper and carrot. Cook for 3-4 minutes on high heat, stirring continuously, until the vegetables are lightly cooked through. Add the noodles, vinegar and soy sauce and toss until the vegetables and noodles are fully combined. Hi Wajeeha! I’m so glad to be here. I tried this Hakka noodles and they turned out amazing! thanks a lot for sharing this lovely recipe!